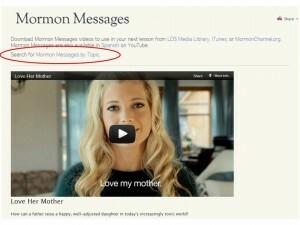 The gallery for the Mormon Messages videos has just added an option to search for Mormon Messages by topic. If you like to use Mormon Messages videos in a lesson or for Family Home Evening, it’s now easier to find videos on a given topic. On one of the old Family Home Evening cassettes was a short story of a woman with cerebral palsy showing how she could thread up a needle and sew using her toes. Has this segment ever been updated to modern media? Where can I find it?